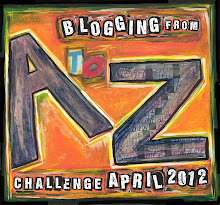 I read about the A to Z Blog Challenge at Amy’s blog http://amybeads.blogspot.com/2012/03/blogging-from-to-zwhy-do-it.html . Looks like the perfect way to be pressurized into blogging. As people who know me says, I work the best under pressure. My theme is going to be Ancient Mysteries – I have some ideas for A and B, well C is another matter! This entry was posted in A to Z Blog Challenge. Bookmark the permalink.